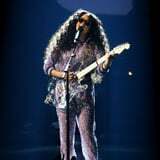 The Grammys featured an all-star lineup of musicians on Sunday, including 21-year-old singer H.E.R. The young San Francisco native graced the stage with a soulful performance of "Hard Place" from her 2018 album I Used to Know Her - Part 2. She beautifully belted out the words while strumming a transparent guitar before heading into a six-string solo. During her set, she rocked a sparkly ensemble with her signature shades.